The Morels of the Story: Sweetbread fritters, morels and summer vegetables cohabit at Le Papillon. IT HAPPENS the minute you walk inside. Stepping through the doors of Le Papillon, you leave the noise and exhaust of busy Saratoga Avenue behind and enter a world of quiet grace that feels miles away from the traffic, the gas stations and the guy nodding his way through a late afternoon beer buzz by the dumpster around the corner. Once inside, classical music tinkles in the background as a host wearing a smart suit welcomes you, looks for your name on the reservation list and politely asks for you to follow him into the dining room. A showy fresh flower arrangement occupies the center of the room and smaller vases of flowers adorn each table. The white shutters, curtains and framed art on the walls give the 40-seat room the feel of a quiet corner in an upscale home where children are not allowed to play. Meanwhile, the formally dressed staff pad about the room in well choreographed but never hurried movements as they proffer menus, noble bottles of wine and some of the most exquisite food you'll find in Silicon Valley. In spite of its unlikely location, Le Papillon has remained one of the South Bay's premier restaurants for elegant (and expensive) French cuisine since it opened in 1977. But unlike some older restaurants that show their age with fusty menus, worn décor and a clientele that rues the day Lawrence Welk went off the air, Le Papillon is as sharp and fresh as ever. Executive chef Scott Cooper, 39, who began his culinary career as a dishwasher at Le Papillon 24 years ago, creates an ever-changing menu of exciting, visually stunning contemporary French food that had me sitting back in my chair more than once, saying, "Dang. That was really good." If you arrive early before the dining room fills up, the restaurant can feel as hushed as a funeral parlor and you'll find yourself whispering so as not to break the quiet mood that hangs in the air. But as soon as more diners arrive and the wine starts flowing and people start eating, the room hums with warm conversation, toasts to birthdays and the contentment that comes with living well, if only for an hour or two. A couple seated next to me on one of my visits were celebrating their anniversary and recounted how they released Monarch butterflies at their wedding, making Le Papillon, which means butterfly in French, the perfect place for the occasion. It's that kind of place. Soon after you're seated, the fun begins. For dinner, the kitchen sends out two or three amuse bouchestiny, complimentary bites of food made with the care of a jewel cutter. Some of my favorites were the chilled pan-seared day-boat scallop served atop finely julienned cucumbers anointed in a sprightly yuzu sauce, one of several Asian influences Cooper sneaks onto the Franco-centric menu. Another gem was the smoked sturgeon mousse piped onto a tiny square of toasted bread. From the list of appetizers, you can't do better than the heirloom tomato salad ($9). Slices of velvety, juicy red and yellow tomatoes are stacked on a coarse-grained Parmesan shortcake. Dabs of pickled red onions, goat cheese sabayon and creamy basil mousseline are served alongside. If want to capture summer on a plate, this is it. Lighter, richer than butter and infinitely more flavorful, the foie gras terrine with mango gastrique ($16) is a dish you may find yourself eating with your eyes closed to better savor before it melts into a fond memory on your tongue. Escargots are a staple of old-line French and blue-hair "continental" restaurants, but Cooper gives the standard a refreshing lift by combining Burgundian snails, candy-sweet roasted garlic and chewy semolina flour dumplings in a buttery ragout. The snails themselves, which can be quite rubbery, were tender orbs of gastropodic delight. The Dungeness crab and citrus salad ($14), a hillock of fresh crab meat and sections of orange and grapefruit topped with microgreens and a subtle Cointreau vinaigrette, sparkled with clean fresh flavors that rejuvenated my palate for the entrees to come. Main courses are more serious dishes and don't have the fireworks of the starters but they still aim high, most of them confidently nailing their target. Fish and game dishes are particularly good. One night's special featured Japanese medai snapper in a sprightly grapefruit beurre blanc ($34). The impeccably fresh fish had stripes of skin left on. The effect looked cool, and when pan-fried, the skin and flesh provided subtly different flavors and textures. Rabbit encrusted in a pleasantly biting coarse-grain mustard ($27) was one of the best preparations of rabbit I've had. The rich, earthy golden chanterelles and hint of anise in the buttery tarragon jus served with it provided just the right match. Two dishes that slipped, if only slightly, were the roasted pheasant ($29) and the pan-roasted veal loin ($32). The thick, juicy slices of pheasant breast were meaty and good but marred by the overly salty cognac jus ladled over it. Similarly, the veal came out of the kitchen perfectly cooked and enrobed in a luxurious Madeira reduction but the heavy, overly battered sweetbread fritters that accompanied it pulled down a dish that already teetered on the edge of too rich. One more quibble: given Cooper's obvious reverence for seasonal produce, I found the use of wintry wild mushrooms on several dishes an off-key note for the dog days of summer. 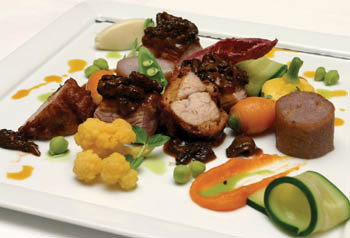 In addition to the regular and the specials menus, Le Papillon serves an appealing tasting menu for $65 per person. The restaurant's expert servers are a great help when navigating the various menus and they know them well. On one visit our waitress steered us away from one dish and to others instead. Not all dishes are created equal and I appreciated her candid advice. Desserts shouldn't be missed. While the desserts we tried were just as beautiful and rich as the rest of the menu, the pastry chef appears to exercise a degree of restraint knowing what kind excess precedes the last course. The poached-pear tart with mascarpone cream and vanilla-sauternes syrup ($7) is a modest-sized dish but the combination a big success. The tart itself was just right: flaky, buttery and light. And I loved the fresh berries corbeille ($9) served in a brittle almond cookie cup and filled with ice cream-thick Grand Marnier cream. From start to finish, a meal at Le Papillon casts a spell on everyone who enters the ivy-covered fortress marooned on this busy street corner. The feeling is only broken when you walk out the door and abruptly step back into the real world outside. Address: 410 Saratoga Ave., San Jose. Hours: Lunch Thu and Fri, dinner nightly. From the August 10-16, 2005 issue of Metro, Silicon Valley's Weekly Newspaper.